1. Separate the Egg White: in the glass end of a Boston Shaker (or the smaller metal piece, if that’s the system you’re using), separate the egg white from the yolk. I think it’s best to do this first in order to assure shards of eggshell haven’t found their way into the mix, as well as getting glimpse at the egg’s quality and freshness. Don’t be scared, it’s just an egg and it probably won’t bite you. The FDA says that only 1 in every 20,000 eggs carries salmonella, but if you’re still squeamish, go with pasteurized or powedered – not quite the same, but good enough. 3. Without ice, give the ingredients a good “dry” shake. Ten to fifteen shakes. 4. Add a lot of ice. The bigger the better. Shake like crazy for as long as you can take it, but try your best to keep it constant – no stops allowed. If you can last five minutes, you’re cooler than I am. Or at least not as feeble. 5. Tap the shaker on the top of the bar a few times, much like a barista would tap steamed milk. 6. Separate your boston set, leaving one side without ice but making sure that small remnants are left in the shaker (should be just a little bit). Strain the drink out of the larger shaker into a chilled collins glass. So what did we do here? Why shake first with no ice? Doing this with egg white cocktails allows the egg to act as an emulsifier. If you want to read a detailed and thoroughly interesting break-down of what’s happening here chemically, I suggest getting a copy of Herald McGee’s On Food and Cooking: The Science and Lore of the Kitchen (pg. 100). Basically, when physically agitated the proteins of the egg white unfold and bond to each other. The shaking and the tugging of ice pulls the proteins out of their natural shape, but these proteins will usually gather back near air, bonding together creating pockets or bubbles – all of which is magnified with the addition of carbonated water. Egg white foam on its own will eventually collapse, so the addition here of acids (the citrus juices) acts as a stabilizing element. Without it, the foam would break back down into a liquid after a while.Again, these steps are what I’ve found most useful. 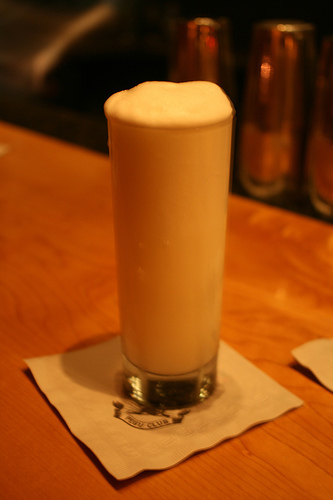 If anyone has tips or disagrees, please comment.Now, this is only one example of a cocktail made with egg white, this being a Silver Fizz – the “silver” indicating the addition of egg white. Certainly, the sour is a natural choice because of its acidic building blocks. The above photo was taken from Vidiot’s Flickr page, which can be viewed here. Thanks Vidiot! This entry was posted on August 8, 2007 at 2:22 am	and is filed under Cocktail Techniques. You can follow any responses to this entry through the RSS 2.0 feed. You can leave a response, or trackback from your own site. The title of this post intrigued me, I’m a big sucker for technique. And as many wonderful Ramos Fizzes I’ve made in my day, I’ve never thought to pour the soda water from a separate vessel. I always used the gun. You’ve improved my technique already. Keep up the great posts! American, I think your second notion is right. The Guardian, being English, has more patience and can always adjust the balance later, which is something the right leaning US outlets canâ€™t. I imagine the Guardian delighted by the brouhaha. I am not familiar with Tre€oÃ±iâv™s output but if he has this tendency to put his foot in it that might have influenced them to go for him. Patsy? Hey, nice site. I’ve added it to my blogroll at my new cocktail blog. One thing — that’s my picture that you used for this post. You’re welcome to use it under the terms of its Creative Commons license, but could you please add attribution to it? A “Photo by Vidiot” credit and link back to the photo’s Flickr page or to my photostream would do just fine. Thanks. Th#;&ee8217rs no catch, but you do have to be careful.Some homes have undisclosed defects, such as bad electrical or pluming. Some have bad foundations. These issues can cost thousands of dollars to repair.Get a Contractor and home inspection before you submit any offers for foreclosed properties. I have found that when using egg whites in a drink I aim to get air in there… So I shake hard and fast in a circular motion, much like one would whisk eggs with a fork. Not so much a circular motion but an elliptical one actually. Probably not that crucial in a Ramos Fizz because of the length of time it is shaken anyway and sustaining that type of motion would be extremely tiring, but in “10-second-shake drinks” I find it works better.